St. John the Baptist Church in Maadi, Cairo is hosting a Coptic Icon Exhibition starting today. 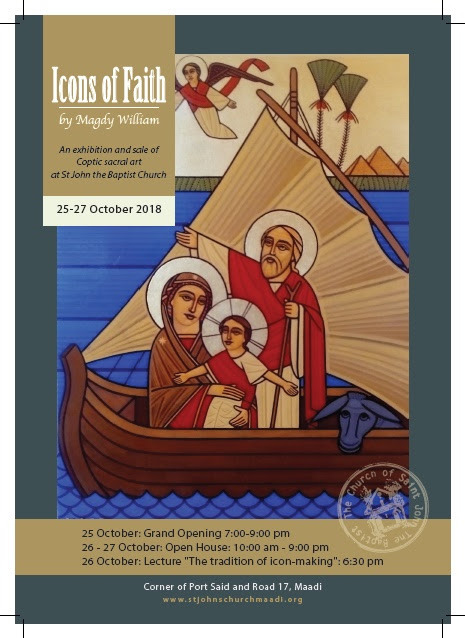 Magdy William is an iconographer working in the diocese of Maadi. He was trained by the famous iconographer Dr. Isaac Fanous (1919-2007) who, from the 1950s onwards until his death, led a movement of art reform in the Coptic Orthodox Church which has resulted in a form of iconography that has become dominant in the church and is seen as distinctively Coptic. Prior to Isaac Fanous’ art reform, iconographers made icons following Italian and Greek styles. Prof. Isaac Fanous’ art was strongly encouraged by H.H. Pope Shenouda since it did fit his reform of the Coptic Orthodox Church; focused on Bible and tradition. Fanous has been teaching hundreds of iconographers, including Magdy William, who all follow his distinct style of Coptic iconography. Pope Shenouda encouraged the iconography of martyrs and saints which was used to underline the image of the Coptic Orthodox Church as a church of martyrs for the true faith and saints as spiritual guides to the true faith. With this Pope Shenouda tried to encourage Christians to remain true to their faith. Such an encouragement was important since many thousands of Christians have converted throughout the past decades to Islam. It was, in Pope Shenouda’s view, better to lose one’s life than to give up one’s faith. Icons thus served the purpose of teaching the laymen Coptic faith and doctrine. 35 For I was hungry and you gave me something to eat, I was thirsty and you gave me something to drink, I was a stranger and you invited me in, 36 I needed clothes and you clothed me, I was sick and you looked after me, I was in prison and you came to visit me.’ (NIV translation). Jesus carrying St. Bishoy, however, came from a sermon of Rev. Dr. Otto Meinardus who was befriended by Pope Shenouda who liked the expansion of the story of St. Bishoy and instructed Dr. Isaac Fanous to use this theme in his iconography. Icons are thus not just paintings, they carry an explicit message for believers. Pope Shenouda was not just a highly influential Christian leader. He also had a political agenda in the sense of trying to strengthen the political influence of the Coptic Orthodox Church as much as possible to an extent that Isaac Fanous resented his influences during the last lengthy meeting I have had with him. Fanous would have preferred a less politically outspoken leader who would have left the artist in Fanous more freedom. Magdy William learned his techniques from Isaac Fanous and then proceeded to give them his own spirit. He is an excellent iconographer with his atelier in the bishopric of Coptic Orthodox Bishop Daniel. Most, if not all, of Coptic iconographers work under such a patronage. Seeing his art and comparing this with the art prior to Isaac Fanous is an excellent way to understand the changes the Coptic Orthodox Church has undergone since the 1950s. The exhibition is at St. John the Baptist Church, Port Said Street in Maadi, at the corner of Street 82 and Street 17. The grand opening is October 25 at 7.00 pm. On October 26, 6.30 pm Magdy William will speak about the tradition of icon making. The exhibition is open on Friday and Saturday between 10.00 am and 9.00 pm. Of course it is possible to request Magdy William to make an icon of your choice.